tablet coating: hypromellose, titanium dioxide, propylene glycol, talc purified, color apple green. Risperidone is a selective monoaminergic antagonist with unique properties. It has a high affinity for serotoninergic 5-HT2 and dopaminergic D2 receptors. Risperidone binds also to alpha1-adrenergic receptors, and, with lower affinity, to H1-histaminergic and alpha2-adrenergic receptors. Risperidone has no affinity for cholinergic receptors. Although risperidone is a potent D2 antagonist, which is considered to improve the positive symptoms of schizophrenia, it causes less depression of motor activity and induction of catalepsy than classical antipsychotics. Balanced central serotonin and dopamine antagonism may reduce extrapyramidal side effect liability and extend the therapeutic activity to the negative and affective symptoms of schizophrenia. The efficacy of risperidone in the short-term treatment of schizophrenia was established in four studies, 4- to 8-weeks in duration, which enrolled over 2500 patients who met DSM-IV criteria for schizophrenia. In a 6-week, placebo-controlled trial involving titration of risperidone in doses up to 10 mg/day administered twice daily, risperidone was superior to placebo on the Brief Psychiatric Rating Scale (BPRS) total score. In an 8-week, placebo-controlled trial involving four fixed doses of risperidone (2, 6, 10, and 16 mg/day, administered twice daily), all four risperidone groups were superior to placebo on the Positive and Negative Syndrome Scale (PANSS) total score. In an 8-week, dose comparison trial involving five fixed doses of risperidone (1, 4, 8, 12, and 16 mg/day administered twice-daily), the 4, 8, and 16 mg/day risperidone dose groups were superior to the 1 mg risperidone dose group on PANSS total score. In a 4-week, placebo-controlled dose comparison trial involving two fixed doses of risperidone (4 and 8 mg/day administered once daily), both risperidone dose groups were superior to placebo on several PANSS measures, including total PANSS and a response measure (>20% reduction in PANSS total score). In a longer-term trial, adult outpatients predominantly meeting DSM-IV criteria for schizophrenia and who had been clinically stable for at least 4 weeks on an antipsychotic medicinal product were randomised to risperidone 2 to 8 mg/day or to haloperidol for 1 to 2 years of observation for relapse. Patients receiving risperidone experienced a significantly longer time to relapse over this time period compared to those receiving haloperidol. The efficacy of risperidone monotherapy in the acute treatment of manic episodes associated with bipolar I disorder was demonstrated in three double-blind, placebo-controlled monotherapy studies in approximately 820 patients who had bipolar I disorder, based on DSM-IV criteria. In the three studies, risperidone 1 to 6 mg/day (starting dose 3 mg in two studies and 2 mg in one study) was shown to be significantly superior to placebo on the pre-specified primary endpoint, i.e., the change from baseline in total Young Mania Rating Scale (YMRS) score at Week 3. Secondary efficacy outcomes were generally consistent with the primary outcome. The percentage of patients with a decrease of 50% in total YMRS score from baseline to the 3-week endpoint was significantly higher for risperidone than for placebo. One of the three studies included a haloperidol arm and a 9-week double-blind maintenance phase. Efficacy was maintained throughout the 9-week maintenance treatment period. Change from baseline in total YMRS showed continued improvement and was comparable between risperidone and haloperidol at Week 12. The efficacy of risperidone in addition to mood stabilisers in the treatment of acute mania was demonstrated in one of two 3-week double-blind studies in approximately 300 patients who met the DSM-IV criteria for bipolar I disorder. In one 3-week study, risperidone 1 to 6 mg/day starting at 2 mg/day in addition to lithium or valproate was superior to lithium or valproate alone on the pre-specified primary endpoint, i.e., the change from baseline in YMRS total score at Week 3. In a second 3-week study, risperidone 1 to 6 mg/day starting at 2 mg/day, combined with lithium, valproate, or carbamazepine was not superior to lithium, valproate, or carbamazepine alone in the reduction of YMRS total score. A possible explanation for the failure of this study was induction of risperidone and 9-hydroxy-risperidone clearance by carbamazepine, leading to subtherapeutic levels of risperidone and 9-hydroxy-risperidone. When the carbamazepine group was excluded in a post-hoc analysis, risperidone combined with lithium or valproate was superior to lithium or valproate alone in the reduction of YMRS total score. The efficacy of risperidone in the treatment of Behavioural and Psychological Symptoms of Dementia (BPSD), which includes behavioural disturbances, such as aggressiveness, agitation, psychosis, activity, and affective disturbances was demonstrated in three double-blind, placebo-controlled studies in 1150 elderly patients with moderate to severe dementia. One study included fixed risperidone doses of 0.5, 1, and 2 mg/day. Two flexible-dose studies included risperidone dose groups in the range of 0.5 to 4 mg/day and 0.5 to 2 mg/day, respectively. Risperidone showed statistically significant and clinically important effectiveness in treating aggression and less consistently in treating agitation and psychosis in elderly dementia patients (as measured by the Behavioural Pathology in Alzheimer’s Disease Rating Scale [BEHAVE-AD] and the Cohen-Mansfield Agitation Inventory [CMAI]). The treatment effect of risperidone was independent of Mini-Mental State Examination (MMSE) score (and consequently of the severity of dementia); of sedative properties of risperidone; of the presence or absence of psychosis; and of the type of dementia, Alzheimer’s, vascular, or mixed. The efficacy of risperidone in the short-term treatment of disruptive behaviours was demonstrated in two double-blind placebo-controlled studies in approximately 240 patients 5 to 12 years of age with a DSM-IV diagnosis of disruptive behaviour disorders (DBD) and borderline intellectual functioning or mild or moderate mental retardation/learning disorder. In the two studies, risperidone 0.02 to 0.06 mg/kg/day was significantly superior to placebo on the pre-specified primary endpoint, i.e., the change from baseline in the Conduct Problem subscale of the Nisonger-Child Behaviour Rating Form (N-CBRF) at Week 6. Risperidone is metabolised to 9-hydroxy-risperidone, which has a similar pharmacological activity to risperidone (see Biotransformation and Elimination). Risperidone is completely absorbed after oral administration, reaching peak plasma concentrations within 1 to 2 hours. The absolute oral bioavailability of risperidone is 70% (CV=25%). The relative oral bioavailability of risperidone from a tablet is 94% (CV=10%) compared with a solution. Theabsorption is not affected by food and thus risperidone can be given with or without meals. Steady-state of risperidone is reached within 1 day in most patients. Steady-state of 9-hydroxy-risperidone is reached within 4-5 days of dosing. Risperidone is rapidly distributed. The volume of distribution is 1-2 l/kg. In plasma, risperidone is bound to albumin and alpha1-acid glycoprotein. The plasma protein binding of risperidone is 90%, that of 9-hydroxy-risperidone is 77%. Risperidone is metabolised by CYP 2D6 to 9-hydroxy-risperidone, which has a similar pharmacological activity as risperidone. Risperidone plus 9-hydroxy-risperidone form the active antipsychotic fraction. CYP 2D6 is subject to genetic polymorphism. Extensive CYP 2D6 metabolisers convert risperidone rapidly into 9-hydroxy-risperidone, whereas poor CYP 2D6 metabolisers convert it much more slowly. Although extensive metabolisers have lower risperidone and higher 9-hydroxy-risperidone concentrations than poor metabolisers, the pharmacokinetics of risperidone and 9-hydroxy-risperidone combined (i.e., the active antipsychotic fraction), after single and multiple doses, are similar in extensive and poor metabolisers of CYP 2D6. Another metabolic pathway of risperidone is N-dealkylation. In vitro studies in human liver microsomes showed that risperidone at clinically relevant concentration does not substantially inhibit the metabolism of medicines metabolised by cytochrome P450 isozymes, including CYP 1A2, CYP 2A6, CYP 2C8/9/10, CYP 2D6, CYP 2E1, CYP 3A4, and CYP 3A5. One week after administration, 70% of the dose is excreted in the urine and 14% in the faeces. In urine, risperidone plus 9-hydroxy-risperidone represent 35-45% of the dose. The remainder is inactive metabolites. After oral administration to psychotic patients, risperidone is eliminated with a half-life of about 3 hours. The elimination half-life of 9-hydroxy-risperidone and of the active antipsychotic fraction is 24 hours. Risperidone plasma concentrations are dose-proportional within the therapeutic dose-range. A single-dose study showed on average a 43% higher active antipsychotic fraction plasma concentrations, a 38% longer half-life and a reduced clearance of the active antipsychotic fraction by 30% in the elderly.Higher active antipsychotic fraction plasma concentrations and a reduced clearance of the active antipsychotic fraction by on average 60% were observed in patients with renal insufficiency. Risperidone plasma concentrations were normal in patients with liver insufficiency, but the mean free fraction of risperidone in plasma was increased by about 35%. The pharmacokinetics of risperidone, 9-hydroxy-risperidone and the active antipsychotic fraction in children are similar to those in adults. A population pharmacokinetic analysis revealed no apparent effect of gender, race or smoking habits on the pharmacokinetics of risperidone or the active antipsychotic fraction. Risperidone is indicated for the treatment of schizophrenia. Risperidone is indicated for the treatment of moderate to severe manic episodes associated with bipolar disorders. Risperidone is indicated for the short-term treatment (up to 6 weeks) of persistent aggression in patients with moderate to severe Alzheimer’s dementia unresponsive to non-pharmacological approaches and when there is a risk of harm to self or others. Risperidone is indicated for the short-term symptomatic treatment (up to 6 weeks) of persistent aggression in conduct disorder in children from the age of 5 years and adolescents with subaverage intellectual functioning or mental retardation diagnosed according to DSM-IV criteria, in whom the severity of aggressive or other disruptive behaviours require pharmacologic treatment. Pharmacological treatment should be an integral part of a more comprehensive treatment programme, including psychosocial and educational intervention. 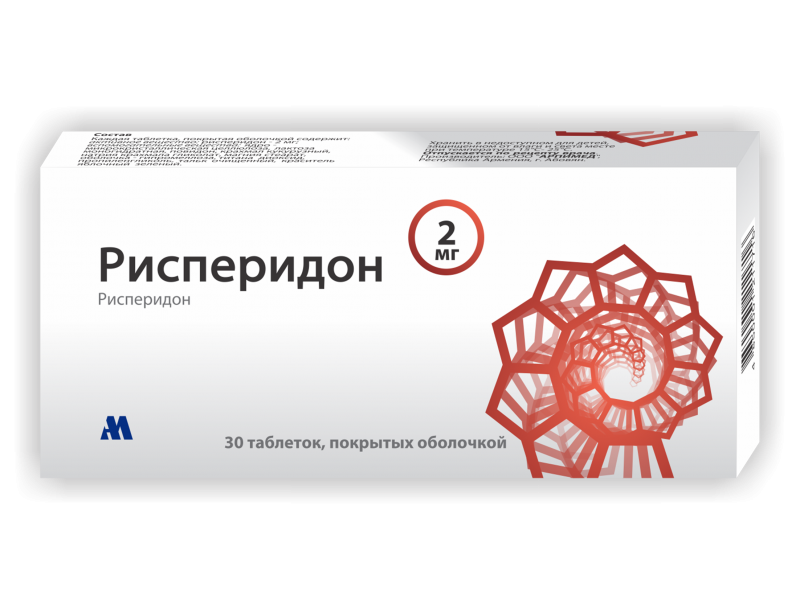 It is recommended that risperidone be prescribed by a specialist in child neurology and child and adolescent psychiatry or physicians well familiar with the treatment of conduct disorder of children and adolescents. Risperidone may be given once daily or twice daily. Patients should start with 2 mg/day risperidone. The dosage may be increased on the second day to 4 mg. Subsequently, the dosage can be maintained unchanged, or further individualised, if needed. Most patients will benefit from daily doses between 4 and 6 mg. In some patients, a slower titration phase and a lower starting and maintenance dose may be appropriate. Doses above 10 mg/day have not demonstrated superior efficacy to lower doses and may cause increased incidence of extrapyramidal symptoms. Safety of doses above 16 mg/day has not been evaluated, and are therefore not recommended. A starting dose of 0.5 mg twice daily is recommended. This dosage can be individually adjusted with 0.5 mg twice daily increments to 1 to 2 mg twice daily. Risperidone is not recommended for use in children below age 18 with schizophrenia due to a lack of data on efficacy. Risperidone should be administered on a once daily schedule, starting with 2 mg risperidone. Dosage adjustments, if indicated, should occur at intervals of not less than 24 hours and in dosage increments of 1 mg per day. Risperidone can be administered in flexible doses over a range of 1 to 6 mg per day to optimize each patient’s level of efficacy and tolerability. Daily doses over 6 mg risperidone have not been investigated in patients with manic episodes. As with all symptomatic treatments, the continued use of RISPERIDONE must be evaluated and justified on an ongoing basis. A starting dose of 0.5 mg twice daily is recommended. This dosage can be individually adjusted with 0.5 mg twice daily increments to 1 to 2 mg twice daily. Since clinical experience in elderly is limited, caution should be exercised. Risperidone is not recommended for use in children below age 18 with bipolar mania due to a lack of data on efficacy. A starting dose of 0.25 mg twice daily is recommended. This dosage can be individually adjusted by increments of 0.25 mg twice daily, not more frequently than every other day, if needed. The optimum dose is 0.5 mg twice daily for most patients. Some patients, however, may benefit from doses up to 1 mg twice daily. Risperidone should not be used more than 6 weeks in patients with persistent aggression in Alzheimer’s dementia. During treatment, patients must be evaluated frequently and regularly, and the need for continuing treatment reassessed. Risperidone is not recommended in children less than 5 years of age, as there is no experience in children less than 5 years of age with this disorder. Patients with renal impairment have less ability to eliminate the active antipsychotic fraction than in adults with normal renal function. Patients with impaired hepatic function have increases in plasma concentration of the free fraction of risperidone. Irrespective of the indication, starting and consecutive dosing should be halved, and dose titration should be slower for patients with renal or hepatic impairment. Risperidone should be used with caution in these groups of patients. Risperidone is for oral use. Food does not affect the absorption of RISPERIDONE. Upon discontinuation, gradual withdrawal is advised. Acute withdrawal symptoms, including nausea, vomiting, sweating, and insomnia have very rarely been described after abrupt cessation of high doses of antipsychotic medicines . Recurrence of psychotic symptoms may also occur, and the emergence of involuntary movement disorders (such as akathisia, dystonia and dyskinesia) has been reported. When medically appropriate, gradual discontinuation of the previous treatment while RISPERIDONE therapy is initiated is recommended. Also, if medically appropriate, when switching patients from depot antipsychotics, initiate RISPERIDONE therapy in place of the next scheduled injection. The need for continuing existing anti-Parkinson medicines should be revaluated periodically. Rare: Neuroleptic malignant syndrome, Diabetic coma, Cerebrovascular disorder, Cerebral ischaemia, Movement disorder. Rare: Visual acuity reduced, Eye rolling, Glaucoma. Rare: Sleep apnea syndrome, Hyperventilation. Rare: Intestinal obstruction, Pancreatitis, Lip swelling, Cheilitis. Uncommon: Urinary retention, Dysuria, Urinary incontinence, Pollakiuria. Rare: Inappropriate antidiuretic hormone secretion. Uncommon: Hypotension, Orthostatic hypotension, Flushing. Rare: Generalised oedema, Hypothermia, Drug withdrawal syndrome, Peripheral coldness. b Extrapyramidal disorder may occur: Parkinsonism (salivary hypersecretion, musculoskeletal stiffness, parkinsonism, drooling, cogwheel rigidity, bradykinesia, hypokinesia, masked facies, muscle tightness, akinesia, nuchal rigidity, muscle rigidity, parkinsonian gait, and glabellar reflex abnormal),akathisia ( akathisia, restlessness, hyperkinesia, and restless leg syndrome), tremor, dyskinesia (dyskinesia, muscle twitching, choreoathetosis, athetosis, and myoclonus), dystonia. Dystonia includes dystonia, muscle spasms, hypertonia, torticollis, muscle contractions involuntary, muscle contracture, blepharospasm, oculogyration, tongue paralysis, facial spasm, laryngospasm, myotonia, opisthotonus, oropharyngeal spasm, pleurothotonus, tongue spasm, and trismus. Tremor includes tremor and parkinsonian rest tremor. It should be noted that a broader spectrum of symptoms are included, that do not necessarily have an extrapyramidal origin. c In placebo-controlled trials diabetes mellitus was reported in 0.18% in risperidone-treated subjects compared to a rate of 0.11% in placebo group. Overall incidence from all clinical trials was 0.43% in all risperidone-treated subjects. In a meta-analysis of 17 controlled trials of atypical antipsychotic drugs, including RISPERIDONE elderly patients with dementia treated with atypical antipsychotics have an increased mortality compared to placebo. In placebo-controlled trials with oral Risperidone in this population, the incidence of mortality was 4.0% for Risperidone -treated patients compared to 3.1% for placebo-treated patients. The odds ratio (95% exact confidence interval) was 1.21 (0.7, 2.1). The mean age (range) of patients who died was 86 years (range 67-100). Data from two large observational studies showed that elderly people with dementia who are treated with conventional antipsychotics are also at a small increased risk of death compared with those who are not treated. There are insufficient data to give a firm estimate of the precise magnitude of the risk and the cause of the increased risk is not known. The extent to which the findings of increased mortality in observational studies may be attributed to the antipsychotic drug as opposed to some characteristic(s) of the patients is not clear. In the Risperidone placebo-controlled trials in elderly patients with dementia, a higher incidence of mortality was observed in patients treated with furosemide plus risperidone (7.3%; mean age 89 years, range 75-97) when compared to patients treated with risperidone alone (3.1%; mean age 84 years, range 70-96) or furosemide alone (4.1%; mean age 80 years, range 67-90). The increase in mortality in patients treated with furosemide plus risperidone was observed in two of the four clinical trials. Concomitant use of risperidone with other diuretics (mainly thiazide diuretics used in low dose) was not associated with similar findings. No pathophysiological mechanism has been identified to explain this finding, and no consistent pattern for cause of death observed. Nevertheless, caution should be exercised and the risks and benefits of this combination or co-treatment with other potent diuretics should be considered prior to the decision to use. There was no increased incidence of mortality among patients taking other diuretics as concomitant treatment with risperidone. Irrespective of treatment, dehydration was an overall risk factor for mortality and should therefore be carefully avoided in elderly patients with dementia. An approximately 3-fold increased risk of cerebrovascular adverse events have been seen in randomised placebo controlled clinical trials in the dementia population with some atypical antipsychotics. The pooled data from six placebo-controlled studies with Risperidone n mainly elderly patients (>65 years of age) with dementia showed that CVAEs (serious and non-serious, combined) occurred in 3.3% (33/1009) of patients treated with risperidone and 1.2% (8/712) of patients treated with placebo. The odds ratio (95% exact confidence interval) was 2.96 (1.34, 7.50). The mechanism for this increased risk is not known. An increased risk cannot be excluded for other antipsychotics or other patient populations. Risperidone should be used with caution in patients with risk factors for stroke. The risk of CVAEs was significantly higher in patients with mixed or vascular type of dementia when compared to Alzheimer’s dementia. Therefore, patients with other types of dementias than Alzheimer’s should not be treated with risperidone. Physicians are advised to assess the risks and benefits of the use of Risperidone in elderly patients with dementia, taking into account risk predictors for stroke in the individual patient. Patients/caregivers should be cautioned to immediately report signs and symptoms of potential CVAEs such as sudden weakness or numbness in the face, arms or legs, and speech or vision problems. All treatment options should be considered without delay, including discontinuation of risperidone. Risperidone should only be used short term for persistent aggression in patients with moderate to severe Alzheimer’s dementia to supplement non-pharmacological approaches which have had limited or no efficacy and when there is potential risk of harm to self or others. Patients should be reassessed regularly, and the need for continuing treatment reassessed. Due to the alpha-blocking activity of risperidone, (orthostatic) hypotension can occur, especially during the initial dose-titration period. Clinically significant hypotension has been observed postmarketing with concomitant use of risperidone and antihypertensive treatment. Risperidone should be used with caution in patients with known cardiovascular disease (e.g., heart failure, myocardial infarction, conduction abnormalities, dehydration, hypovolemia, or cerebrovascular disease), and the dosage should be gradually titrated as recommended (see section 4.2). A dose reduction should be considered if hypotension occurs. Medicines with dopamine receptor antagonistic properties have been associated with the induction of tardive dyskinesia characterised by rhythmical involuntary movements, predominantly of the tongue and/or face. The onset of extrapyramidal symptoms is a risk factor for tardive dyskinesia. If signs and symptoms of tardive dyskinesia appear, the discontinuation of all antipsychotics should be considered. Neuroleptic Malignant Syndrome, characterised by hyperthermia, muscle rigidity, autonomic instability, altered consciousness and elevated serum creatine phosphokinase levels has been reported to occur with antipsychotics. Additional signs may include myoglobinuria (rhabdomyolysis) and acute renal failure. In this event, all antipsychotics, including Risperidone, should be discontinued. Physicians should weigh the risks versus the benefits when prescribing antipsychotics, including Risperidone, to patients with Parkinson’s Disease or Dementia with Lewy Bodies (DLB). Parkinson’s Disease may worsen with risperidone. Both groups may be at increased risk of Neuroleptic Malignant Syndrome as well as having an increased sensitivity to antipsychotic medicinal products; these patients were excluded from clinical trials. Manifestation of this increased sensitivity can include confusion, obtundation, postural instability with frequent falls, in addition to extrapyramidal symptoms. Hyperglycaemia, diabetes mellitus and exacerbation of pre-existing diabetes have been reported during treatment with RISPERIDONE In some cases, a prior increase in body weight has been reported which may be a predisposing factor. Association with ketoacidosis has been reported very rarely, and rarely with diabetic coma. Appropriate clinical monitoring is advisable in accordance with utilised antipsychotic guidelines. Patients treated with any atypical antipsychotic, including RISPERIDONE should be monitored for symptoms of hyperglycaemia (such as polydipsia, polyuria, polyphagia and weakness) and patients with diabetes mellitus should be monitored regularly for worsening of glucose control. Significant weight gain has been reported with Risperidone use. Weight should be monitored regularly. Tissue culture studies suggest that cell growth in human breast tumours may be stimulated by prolactin. Although no clear association with the administration of antipsychotics has so far been demonstrated in clinical and epidemiological studies, caution is recommended in patients with relevant medical history. Risperidone should be used with caution in patients with pre-existing hyperprolactinaemia and in patients with possible prolactin-dependent tumours. QT prolongation has very rarely been reported postmarketing. As with other antipsychotics, caution should be exercised when risperidone is prescribed in patients with known cardiovascular disease, family history of QT prolongation, bradycardia, or electrolyte disturbances (hypokalaemia, hypomagnesaemia), as it may increase the risk of arrhythmogenic effects, and in concomitant use with medicines known to prolong the QT interval. Risperidone should be used cautiously in patients with a history of seizures or other conditions that potentially lower the seizure threshold. Priapism may occur with Risperidone treatment due to its alpha-adrenergic blocking effects. Disruption of the body’s ability to reduce core body temperature has been attributed to antipsychotic medicines. Appropriate care is advised when prescribing Risperidone to patients who will be experiencing conditions which may contribute to an elevation in core body temperature, e.g., exercising strenuously, exposure to extreme heat, receiving concomitant treatment with anticholinergic activity, or being subject to dehydration. Cases of venous thromboembolism (VTE) have been reported with antipsychotic drugs. Since patients treated with antipsychotics often present with acquired risk factors for VTE, all possible risk factors for VTE should be identified before and during treatment with Risperidone and preventative measures undertaken. Before risperidone is prescribed to a child or adolescent with conduct disorder they should be fully assessed for physical and social causes of the aggressive behaviour such as pain or inappropriate environmental demands. The sedative effect of risperidone should be closely monitored in this population because of possible consequences on learning ability. A change in the time of administration of risperidone could improve the impact of the sedation on attention faculties of children and adolescents. Risperidone was associated with mean increases in body weight and body mass index (BMI). Changes in height in the long-term open-label extension studies were within expected age-appropriate norms. The effect of long-term risperidone treatment on sexual maturation and height have not been adequately studied. Because of the potential effects of prolonged hyperprolactinemia on growth and sexual maturation in children and adolescents, regular clinical evaluation of endocrinological status should be considered, including measurements of height, weight, sexual maturation, monitoring of menstrual functioning, and other potential prolactin-related effects. During treatment with risperidone regular examination for extrapyramidal symptoms and other movement disorders should also be conducted. For specific posology recommendations in children and adolescents. The film-coated tablets contain lactose. Patients with rare hereditary problems of galactose intolerance, the Lapp lactase deficiency or glucose-galactose malabsorption should not take this medicine. In general, reported signs and symptoms have been those resulting from an exaggeration of the known pharmacological effects of risperidone. These include drowsiness and sedation, tachycardia and hypotension, and extrapyramidal symptoms. In overdose, QT-prolongation and convulsions have been reported. Torsade de Pointes has been reported in association with combined overdose of Risperidone and paroxetine. In case of acute overdose, the possibility of multiple drug involvement should be considered. Establish and maintain a clear airway and ensure adequate oxygenation and ventilation. Gastric lavage (after intubation, if the patient is unconscious) and administration of activated charcoal together with a laxative should be considered only when drug intake was less than one hour before. Cardiovascular monitoring should commence immediately and should include continuous electrocardiographic monitoring to detect possible arrhythmias. There is no specific antidote to Risperidone. Therefore, appropriate supportive measures should be instituted. Hypotension and circulatory collapse should be treated with appropriate measures such as intravenous fluids and/or sympathomimetic agents. In case of severe extrapyramidal symptoms, an anticholinergic medicinal product should be administered. Close medical supervision and monitoring should continue until the patient recovers. There are no adequate data from the use of risperidone in pregnant women. According to postmarketing data reversible extrapyramidal symptoms in the neonate were observed following the use of risperidone during the last trimester of pregnancy. Consequently newborns should be monitored carefully. Risperidone was not teratogenic in animal studies but other types of reproductive toxicity were seen . The potential risk for humans is unknown. Therefore, Risperidone should not be used during pregnancy unless clearly necessary. If discontinuation during pregnancy is necessary, it should not be done abruptly. In animal studies, risperidone and 9-hydroxy-risperidone are excreted in the milk. It has been demonstrated that risperidone and 9-hydroxy-risperidone are also excreted in human breast milk in small quantities. There are no data available on adverse reactions in breast-feeding infants. Therefore, the advantage of breast-feeding should be weighed against the potential risks for the child. As with other antipsychotics, caution is advised when prescribing risperidone with medicinal products known to prolong the QT interval, e.g., class Ia antiarrhythmics (e.g., quinidine, dysopiramide, procainamide), class III antiarrhythmics (e.g., amiodarone, sotalol), tricyclic antidepressant (i.e., amitriptyline), tetracyclic antidepressants (i.e., maprotiline), some antihistaminics, other antipsychotics, some antimalarials (i.e., chinice and mefloquine), and with medicines causing electrolyte imbalance (hypokalaemia, hypomagnesiaemia), bradycardia, or those which inhibit the hepatic metabolism of risperidone. This list is indicative and not exhaustive. Risperidone should be used with caution in combination with other centrally-acting substances notably including alcohol, opiates, antihistamines and benzodiazepines due to the increased risk of sedation. Risperidone may antagonise the effect of levodopa and other dopamine agonists. If this combination is deemed necessary, particularly in end-stage Parkinson’s disease, the lowest effective dose of each treatment should be prescribed. Clinically significant hypotension has been observed postmarketing with concomitant use of risperidone and antihypertensive treatment. Risperidone does not show a clinically relevant effect on the pharmacokinetics of lithium, valproate, digoxin or topiramate. Carbamazepine has been shown to decrease the plasma concentrations of the active antipsychotic fraction of risperidone. Similar effects may be observed with e.g. rifampicin, phenytoin and phenobarbital which also induce CYP 3A4 hepatic enzyme as well as P-glycoprotein. When carbamazepine or other CYP 3A4 hepatic enzyme/P-glycoprotein (P-gp) inducers are initiated or discontinued, the physician should re-evaluate the dosing of Risperidone. Fluoxetine and paroxetine, CYP 2D6 inhibitors, increase the plasma concentration of risperidone, but less so of the active antipsychotic fraction. It is expected that other CYP 2D6 inhibitors, such as quinidine, may affect the plasma concentrations of risperidone in a similar way. When concomitant fluoxetine or paroxetine is initiated or discontinued, the physician should re-evaluate the dosing of Risperidone. Verapamil, an inhibitor of CYP 3A4 and P-gp, increases the plasma concentration of Risperidone. Galantamine and donepezil do not show a clinically relevant effect on the pharmacokinetics of risperidone and on the active antipsychotic fraction. Phenothiazines, tricyclic antidepressants, and some beta-blockers may increase the plasma concentrations of risperidone but not those of the active antipsychotic fraction. Amitriptyline does not affect the pharmacokinetics of risperidone or the active antipsychotic fraction. Cimetidine and ranitidine increase the bioavailability of risperidone, but only marginally that of the active antipsychotic fraction. Erythromycin, a CYP 3A4 inhibitor, does not change the pharmacokinetics of risperidone and the active antipsychotic fraction. The combined use of psychostimulants (e.g., methylphenidate) with Risperidone in children and adolescents did not alter the pharmacokinetics and efficacy of Risperidone. Regarding increased mortality in elderly patients with dementia concomitantly receiving furosemide. Concomitant use of oral Risperidone with paliperidone is not recommended as paliperidone is the active metabolite of risperidone and the combination of the two may lead to additive active antipsychotic fraction exposure. 30 tablets, 3 blisters (1 blister packet with 10 tablets) with leaflets in the cardboard box.